Before we entered the iron gates attached to fig-vine-covered stone pillars, my jealousy meter started going off. At first, I thought this stucco house, new but perfectly constructed to harken back to another time and another place, was the only house inside a fence where placid cattle and a few donkeys grazed lazily. Then, I realized that the house in view, the one we were visiting, just happened to have enough land to suggest an estate. It was actually situated in a sort of gated community, two words that usually make my eyes glaze over. Not this time, however. We had gone there to watch the sun set over the Intercoastal waterway, near Pawleys Island, South Carolina, where I've vacationed for some 40 years. I had no idea this dreamy landscape existed only two miles or less from the oceanfront. Well, the latter statement isn't exactly true. In May, my younger daughter was married at Pawleys Island (I'm thinking that this destination wedding, with the reception held outdoors at a rustic old inn on the ocean, took several years off my life. However, the awful, rainy weather predicted on Sunday before that Saturday, turned into a cool, perfect evening with no humidity and only the slightest ruffle of a breeze; still, the damage had been done). But, about the beautiful scenery nearby. The rehearsal dinner given by her future in-laws was held at a former rice plantation, now with a golf course and beautiful grounds. 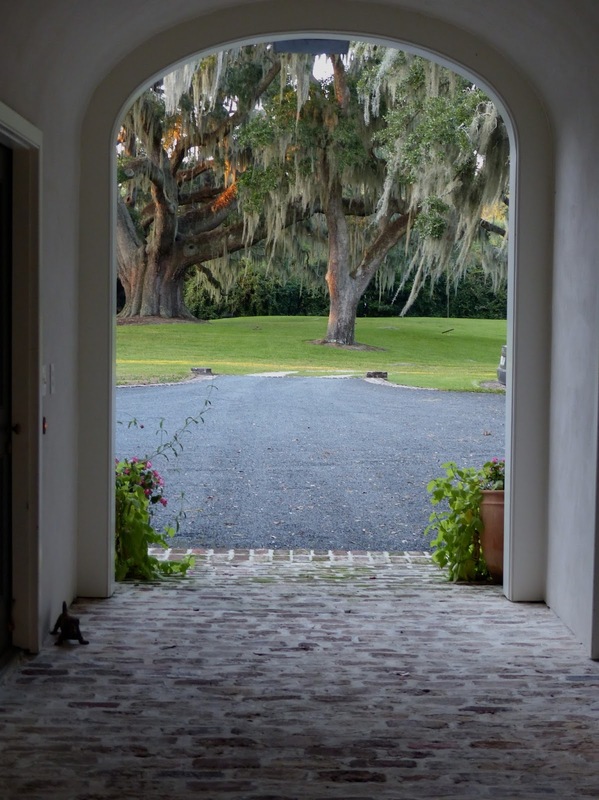 This magical place, entered by a curving allee lined with ancient live oaks hung with Spanish moss, was just down the waterway from the house pictured above. The view to the west was much the same, looking out over marshland to the water beyond. We were all mystified that we never knew this stunningly beautiful place existed. Back to the recent August evening. Our host helped design the house. One of the reasons the two-story, white stucco house looked like it had been there forever (it helped that the exterior walls were already streaked by weather) was the setting among huge live oaks that had been there for centuries. The drive-through you see above (you're looking out at the side lawn, which carries around to the front of the house and slopes very gently to the pastures beyond) is paved with bricks found on the site and leads to the back of the house where a hexagonal outbuilding is covered with fig vine. This charming, slate-roofed structure overlooks a parterre planted with herbs and cutting flowers. Beyond is the waterway visible above more lawns and through live oaks hung with gray moss. I won't even go into the magazine-perfect interiors. The rooms, either with heart pine or ancient brick floors, were so wonderfully appointed that my heart fluttered with envy (I know that breaks the Ten Commandments; I was ashamed of the way I felt). We watched the sunset from a screened porch that ran all along the back of the house. More live oaks, a swing with a wide arc hanging from a high branch, lovely shade plants at the base of the porch, a view of the distant water. Actually, when I think about it, there really weren't many "gardens", but more of a dreamy setting so beautifully preserved and honored by the owners. This was a case of "less is more", although keeping all those sweeping lawns mown and cleaned of limbs could hardly be called low-maintenace. It was indeed a treat to see. As the sun set over the water and the stars began to twinkle high above, I felt more grateful than envious - but not much. A one-day break today in a long stream of days in the mid-90's in Atlanta. It's been like this for a month. My air-conditioning bill was bad for June; I can't imagine what it's going to be like for the month of July. I'll know in a couple of weeks. What you see above is my almost two-year-old "arch" garden on a hot, dry summer day. It looks nothing like I'd envisioned. The first of the three arches should have been smothered in re-blooming roses by now. You can barely make out the few spindly canes near the bottom right side of the arbor. Actually, I don't think you can see them at all. On the left is Confederate jasmine. My neighbor gave me the plants after they didn't work out for her. They are not 'Madison', which is hardier here in Atlanta. And, since the plants (there's one on the second arch, as well) are on the east side of the house, the winter sun hits them in early morning. If there's a hard freeze, they get zapped and turn brown. About mid-summer, they recover, but not enough to cover the arbor. In the foreground are two ivy topiaries I rescued after using them at church for two Christmases in a row. This was back in 2000 and 2001. It took a long time to get them lush and green again. They flank the entrance from the driveway to the garden. That's Boston ivy (Parthenocissus tricuspidata) up high on the side of the house. The tall, clipped shrubs against the wall are Japanese hollies. I used to know the selection - they grow in a cone shape. I've had them for at least 25 years. Between them are chest-high American boxwoods. Opposite them, a row of English boxwoods forms a shaggy, knee-high hedge. Just out of sight along the little cobblestone walls are low Korean boxwood hedges, sheared into a long line. On the left, there is an additional row of the same boxwoods atop another low cobblestone where an ivy topiary - shaped like a globe - anchors the corner. The "tree" you see to the left of the third arch is an orange tea olive. I haven't had the heart to cut the top out to force side branches cover the arch, which was my original intention. I'm giving you this tedious list to say that the colorful, blousy garden I'd had in my mind is not to be. My calculation of how much sun I would have in spring and summer was way off. Only at the end - where you see the concrete bench - do I have a spot of sun. I have an out-of-control-because-it-has-no-support 'Graham Stuart Thomas' yellow English rose. I plopped it there in the worst clay, but I have promised it that there will be loads of mulch from the compost pile soon to come to cool the roots. Also, I'll be vigilant about feeding. Still, it has given me some of those odd-colored, but beautiful dusky yellow roses. They will also have an arbor to climb, but I haven't decided the size yet. All this to tell you that I only have a green garden right now. 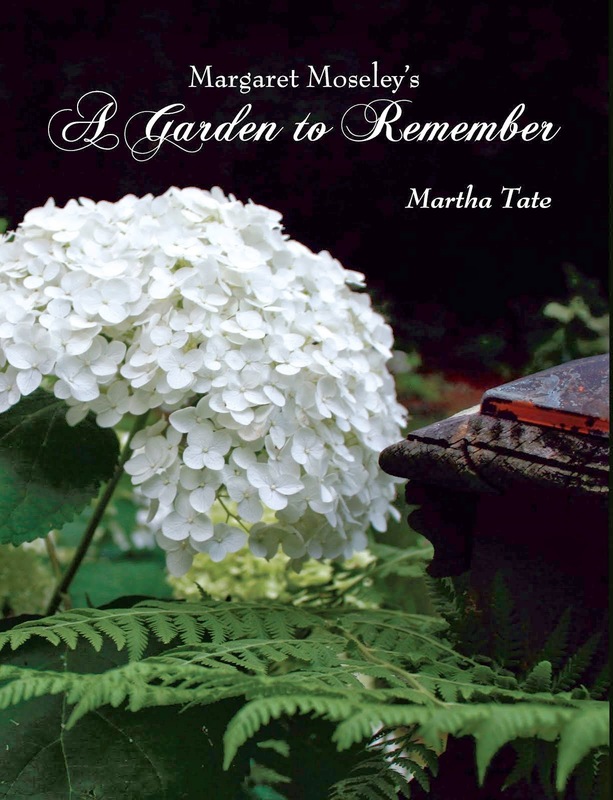 That one white bloom is a late-occurring 'Annabelle' hydrangea. So far, it's protected from the deer, although I'm disheartened by the four giant bucks I see every morning. A worker who came to my house when I wasn't here, found them walking leisurely through the arches. I've been around long enough to realize that there are ways to introduce color to this mostly shady garden area. I will be looking for a sasanqua espalier to go against the near wall where I had thought roses would climb. I also rooted some Hydrangea macrophylla plants that have enormous pink blooms to fill in the empty space on the right. They are coming along nicely a year after I snipped a few cuttings (with permission) from the Piedmont Driving Club. And, if all goes well, in a couple of months, I'll have some lavender-colored Aster tataricus (rescued from the opposite side of the house where I have a bit of sun but no protection from the deer) blooming right behind the ivy topiaries. But for the time being, I must tell myself that it is okay not to have a riot of yellows, reds, pinks and blues like I wanted. After all, green is a color, and it happens to be my favorite - very soothing in this heat. At least that's how I'm rationalizing everything right now. I don't know how long this attitude will last.